Fleet Admiral Castor Dane, as his title suggests, is a high-ranking fleet force official, and leader of a Galactic Federation unit. 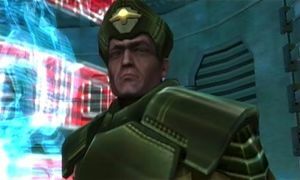 He has a prominent role in Metroid Prime 3, as he orders Samus to complete her main mission objectives along with Aurora Unit 242 throughout Corruption. As he and Aurora Unit 242 are giving Samus, Rundas, Ghor, and Gandrayda a briefing on how to disable the three Leviathan Seeds that landed in Bryyo, Elysia, and the Pirate Homeworld, Space Pirates attack Dane's fleet, prompting him to ask the Bounty Hunters for help. Throughout the events of Corruption, Dane and AU 242 guide Samus with objectives and instructions on how to complete the next primary or secondary missionary objective. After Samus destroys the Seeds, Dane requests her to infiltrate the Leviathan starship located in the Pirate Homeworld's orbit, which is capable of creating a wormhole to Phaaze. Phaaze is responsible for creating and launching the Leviathan seeds. He is first introduced in the first visit to the Galactic Federation Flagship Olympus, where he orders Samus and the other bounty hunters to stop an attack on Norion. Fleet Admiral Castor Dane is known for his utmost dedication to protecting the Federation from its enemies. He is stern and aggressive, and has a strong dislike for the Space Pirates. Rumor has it they orphaned him at an early age, an act he still seeks to avenge. Considering Samus is a Bounty Hunter, it is questionable if Dane or anyone else ever paid Samus her bounty for completing the other missions. This is also notable in several other Metroid titles. This page was last edited on 7 October 2011, at 04:19. This page has been accessed 11,928 times.